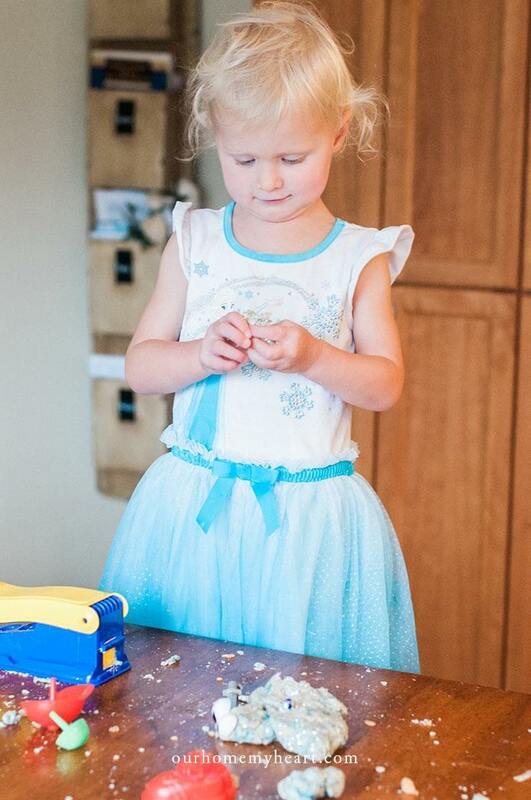 Bring sparkle and joy into the lives of your little ones. 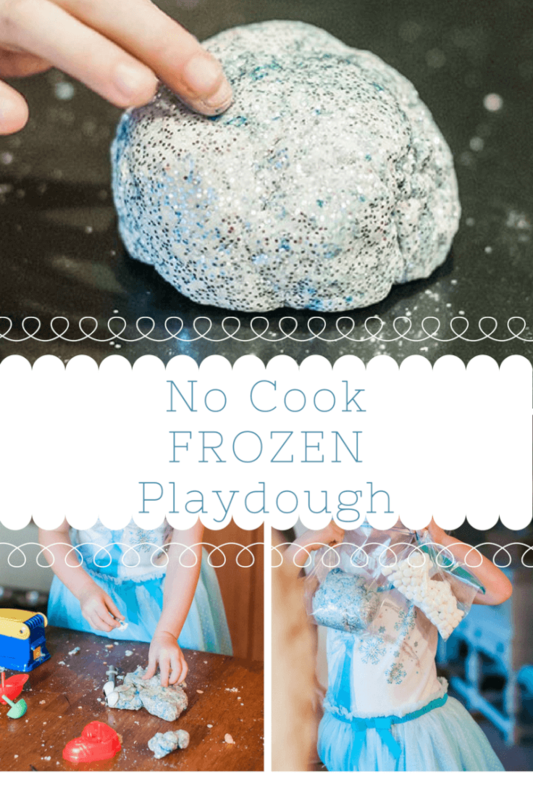 No cook Frozen playdough takes just minutes to make and brings hours of fun to your children. 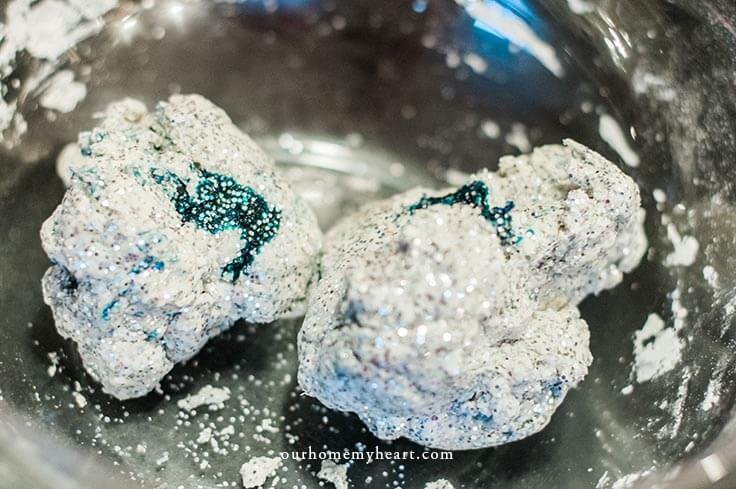 No Cook FROZEN Playdough is a simple way to bring some sparkle and joy into the lives of your little ones after the holidays. 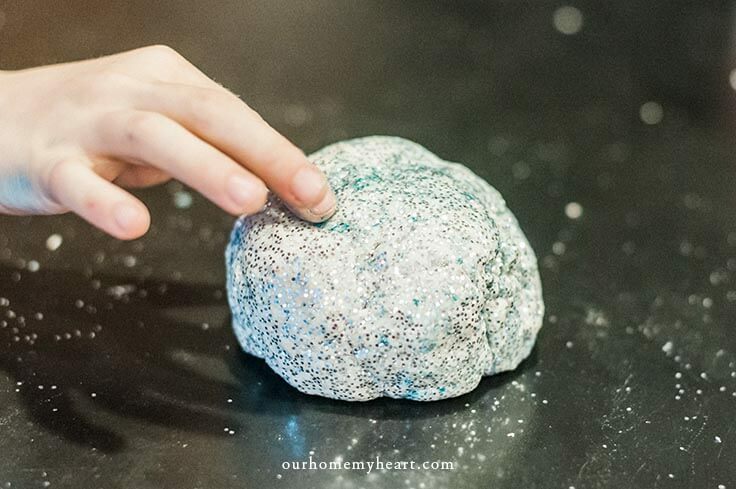 It takes you just minutes to make and brings hours of fun to your children. 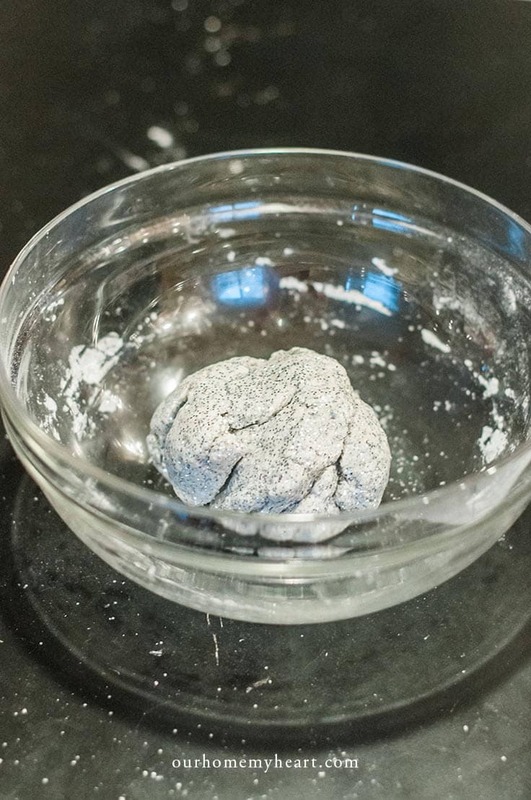 No Cook FROZEN Playdough: Made with just a few simple ingredients. 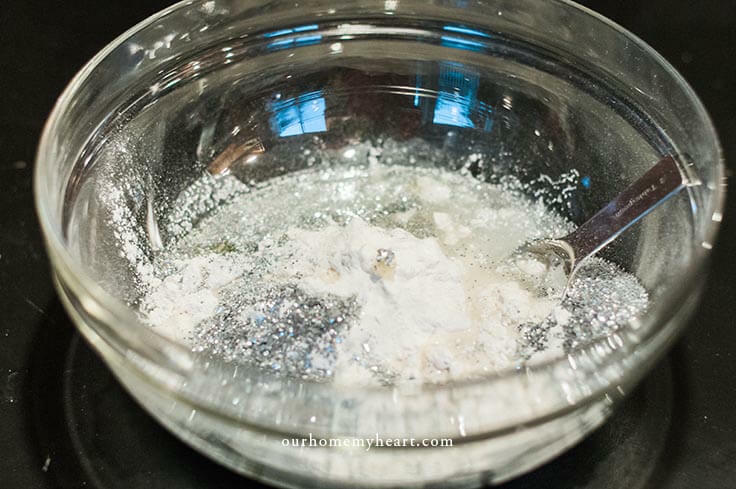 Pour them all into the bowl, except for the few tablespoons of water. 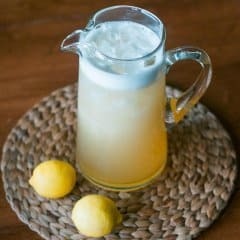 Start by mixing with a spoon. 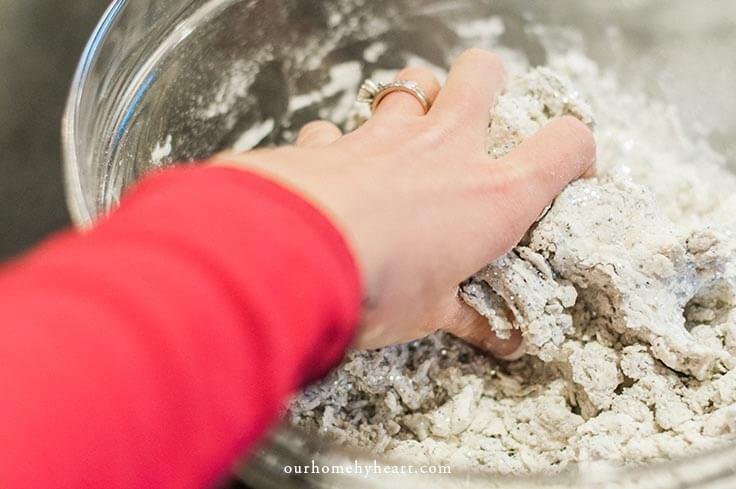 Then begin kneading with your hands. It will start out crumbly. 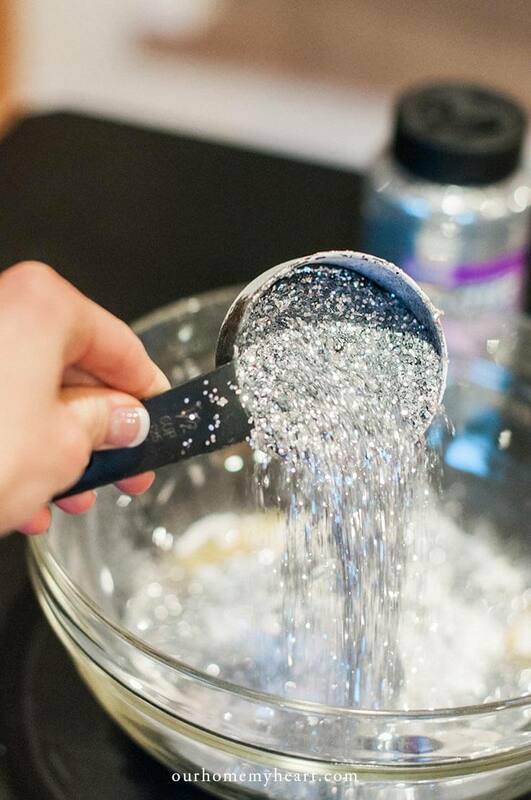 Add in the rest of the water at a time until it all sticks into a ball. 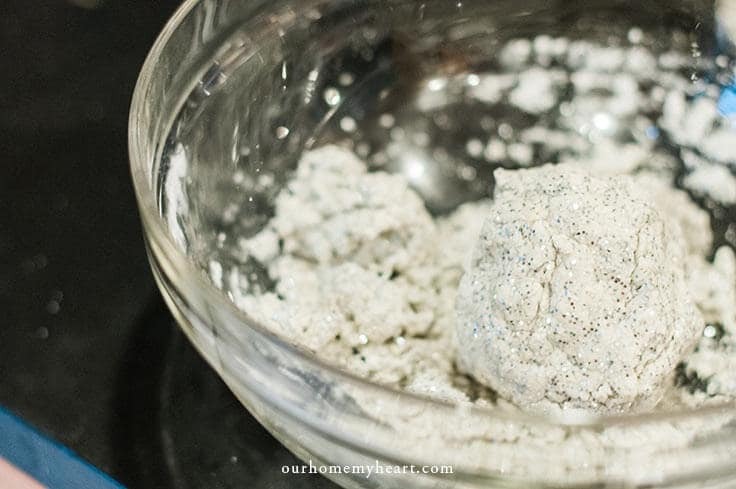 You know you’re finished with the No Cook Frozen Playdough when there isn’t anything left in the bowl, except the finished product. 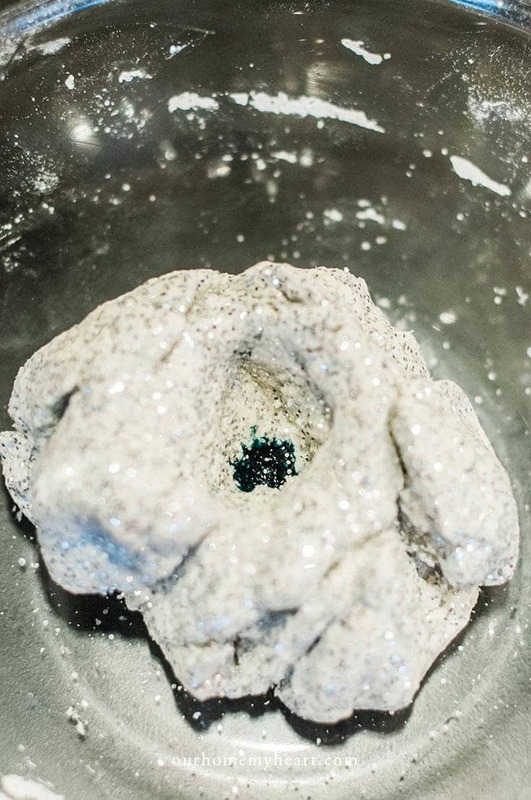 Press the dough down in the middle and place a drop of blue food coloring inside. 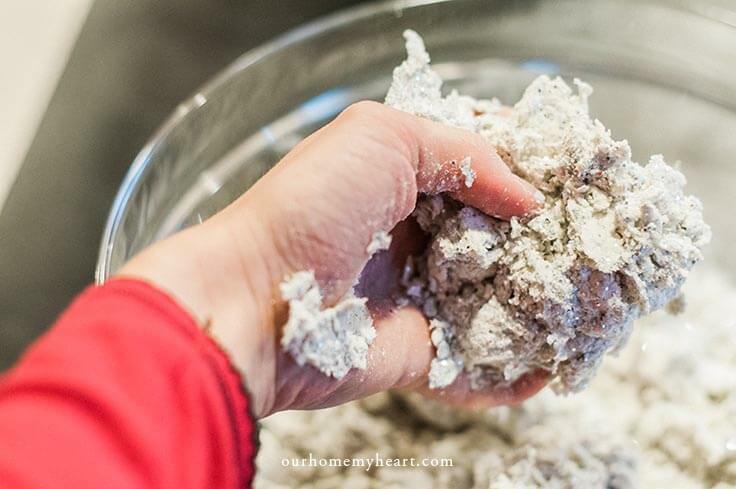 Continue to knead the dough and add food coloring. Your final product will have a marbled effect. And your kids won’t be able to wait to play with it! 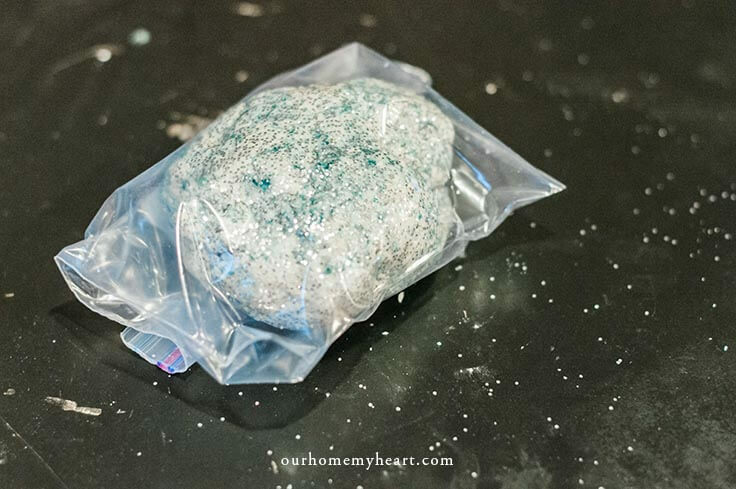 Place the No Cook Frozen Playdough in an airtight bag to keep it soft and pliable. This Elsa loving girl was in heaven! 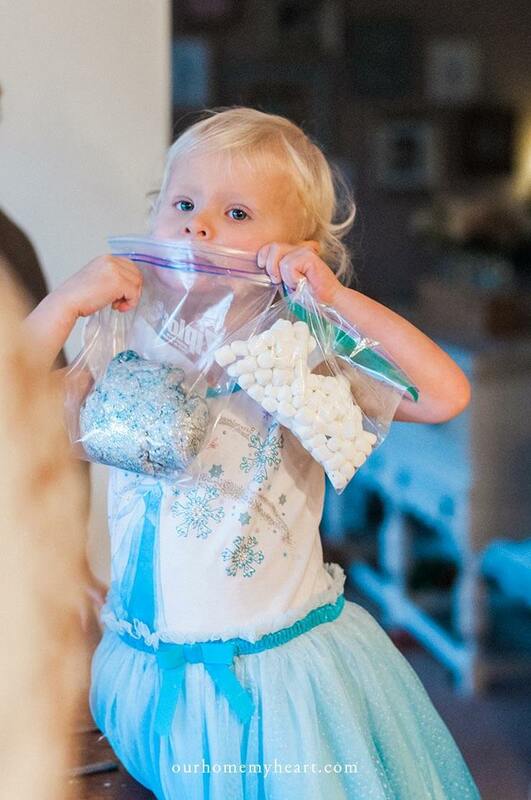 And don’t ask me why she has a bag of marshmallows in her hand, other than the fact that it was Christmas-time. She lost no time, and broke open the bag right away. 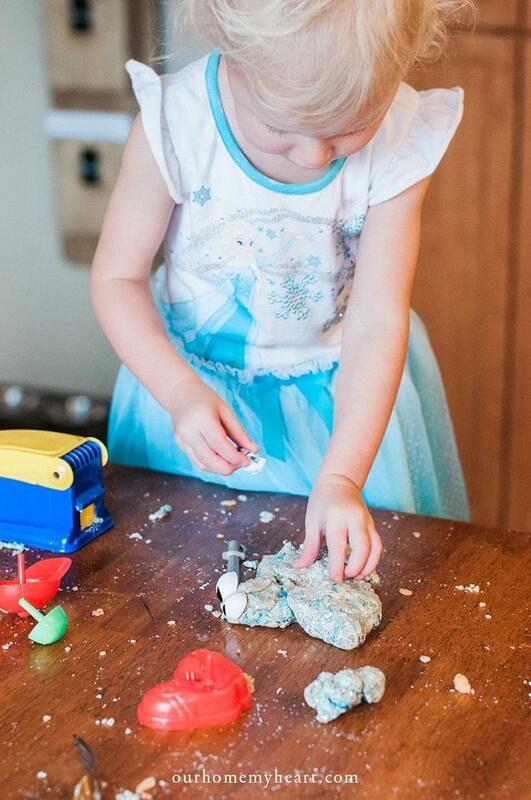 She was entertained with this No Cook Frozen Playdough for hours and I was able to finish my laundry and vacuuming. A win-win if you ask me! Come visit me over at Our Homestead Where My Heart Is to learn a little more about me and how I strive to have special moments like these with my little ones. Alycia lives on a 5 acre homestead just north of Seattle, WA with her husband, 4 kiddos and over 50 animals. Her many interests include gardening, real food cooking, reading books, photography, watercolor painting, homeschooling her kids, and milking her goats. 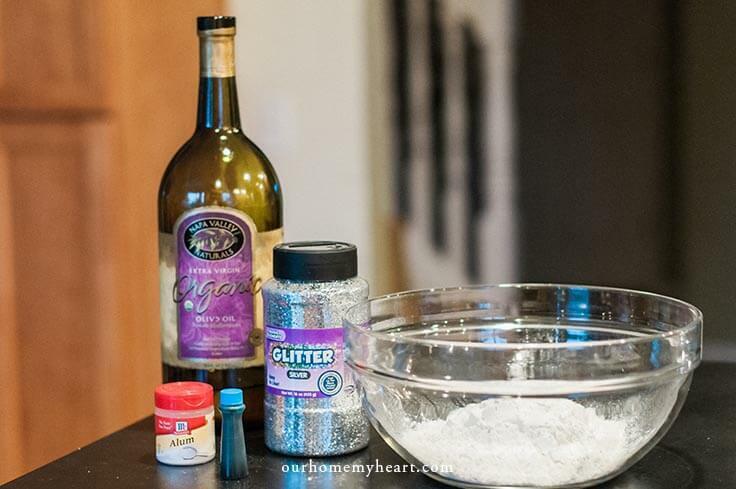 On top of that, she loves to design and create DIY projects to decorate her home and share on her blog, Our Homestead Where My Heart Is. She lives for quiet moments when she can sit on her porch with her knitting and an audiobook. A simple, yet fulfilling life is her goal. You can just call her an old lady at heart with a little bit of a modern flair. 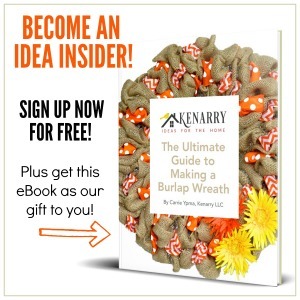 Alycia was part of the Creative Team on Ideas for the Home by Kenarry™ from October 2016 - September 2017. Follow Alycia on Facebook, Twitter, Pinterest and Instagram. Love this! My daughter is an Anna lover and will only wear dress up clothes. She will love this playdough. 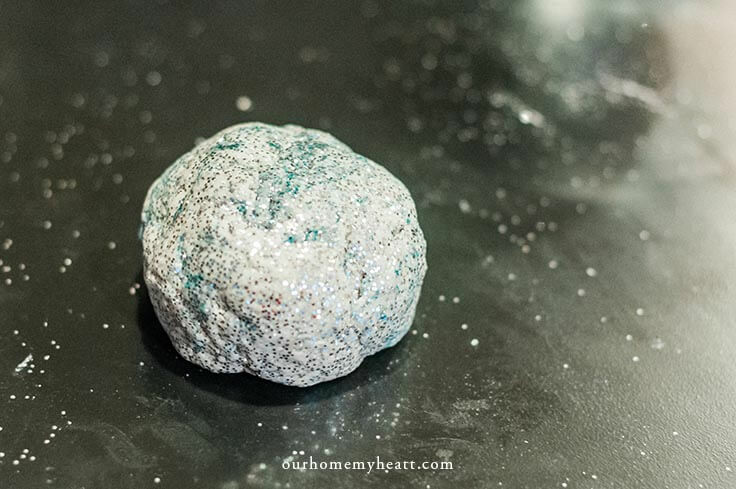 Rachel, hope you and your daughter enjoy playing with this fun sparkly playdough!